Never Enough Nails: OPI Hello Kitty Swatches, Part 1!! Hi everyone!! I have some pretty OPI Hello Kitty swatches to brighten up your Monday! I have been super excited for this collection for awhile now, since I love Hello Kitty! But even if you are not a rabid HK fan, I think you will find some polishes to love in this collection. I am showing you my favorite of this half first, OPI Spoken from the Heart. Spoken from the Heart is a bright and beautiful pink coral crelly. This is a nice blend of hot pink with a touch of orange and the finish is so juicy and squishy! The crelly finish sets it apart from other corals I own for sure! This is three thin coats, but I did the third just for the camera, it looks perfect with two coats. The application was excellent. The formula has that gel feeling to it and really stays where you apply it without any puddling or pooling. If you like the jelly look, this is perfectly smooth and streak-free in just one coat, so you can sport it that way as well! This candy pink treat is OPI Look at My Bow!. Look at My Bow! is a baby pink creme with a healthy dose of lavender to make it more interesting. It reminds me of a pinker version of my fave OPI Lucky Lucky Lavender. I am a big fan of Look at My Bow!, it's super pretty and spring-y! This is two coats and application was very good. It has a very smooth formula and it is nicely opaque. 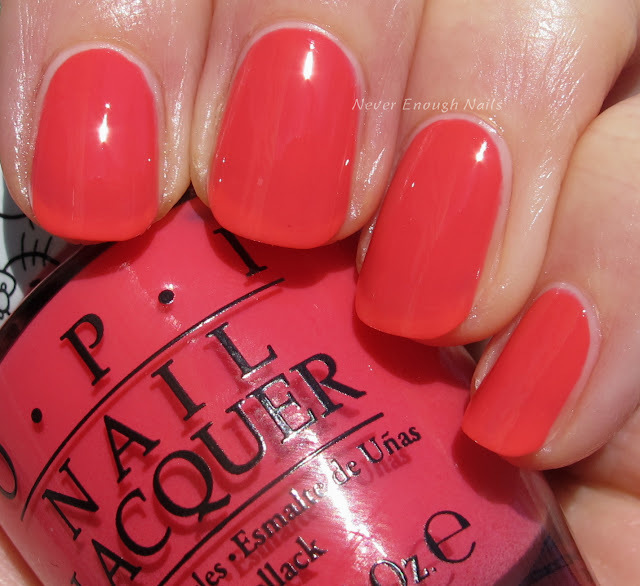 I have been searching for something just like OPI Small plus Cute equals Heart for ages! If you've been looking for something soft pink and squishy, but more opaque than OPI Bubble Bath, this one is for you. This is a great pale pink crelly that is still juicy looking without being too sheer. It reminds me of strawberry milk with only a little bit of strawberry sauce. This is three thin coats of Small plus Cute equals Heart. It is sheer on the first coat, but builds to full opacity in three coats, so you have options if you like some VNL. It was easy to apply and had that nice gel-like consistency. 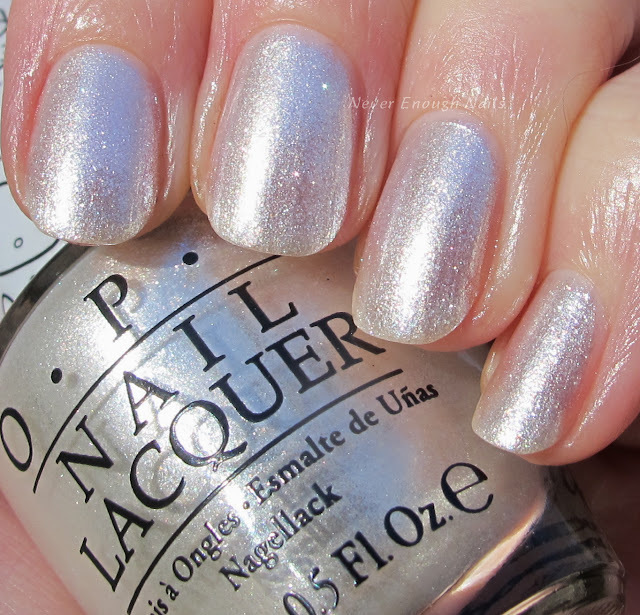 OPI Kitty White is a super sparkly silvery white. It looks like the snow sparkling on my lawn right now! This is three coats of Kitty White alone, so you can definitely build it up to wear by itself. I also think it would be a great topper with just one coat over one of the cremes in this collection because one coat of this is pretty sheer. 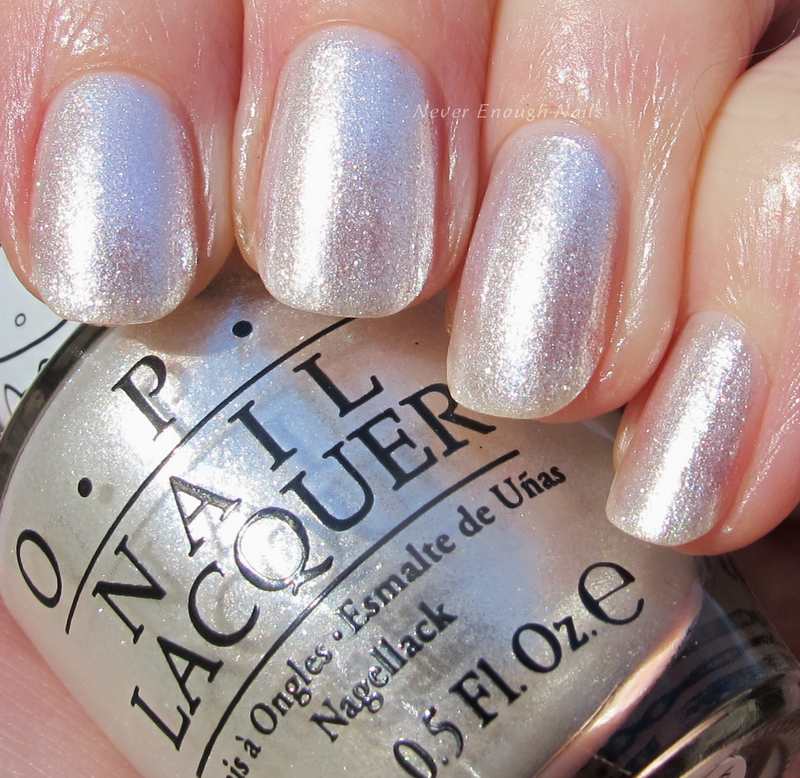 OPI Charmmy & Sugar has a frosty pinky silver metallic base with pops of teal, silver and pink metallic glitters. The base of this is kind of shifty, when you move your nails around you catch glimpses of gold and magenta shimmer. I think this is actually way prettier in real life!! This is three coats of Charmmy & Sugar. It was easy to work with and the glitters are quite smooth with one layer of top coat. It looks a little bumpy in pictures I think, but it wasn't at all rough in real life. It is also more opaque looking in person. I have to hand it to OPI. They just made me like soft-colored crellies by putting little kitties on the tops of the bottles and making them slightly more opaque than other variations. OPI Let's Be Friends is another dreamboat soft white pink crelly. I can't decide whether to call this one "white with a hint of pink" or "pink with a lot of white in the base". I think I'm going with white with a hint of pink. Like I said about Small plus Cute, this one is so great if you like soft crellies with the option for full opacity. You can wear it sheer at one or two coats, and it builds up to full coverage in three. The formula was very good, no streaking despite the pale color and the consistency is sort of gel-like. I am completely in love with this half of the Hello Kitty collection! I can't wait to try the other half. I am not sure I can even pick a favorite here... maybe Spoken from the Heart, but I love the others too. The OPI Hello Kitty collection is available now at Ulta, Ulta.com and other fine salons.